mindful movement with intelligent sequencing, focus on alignment and breath, opening to greater awareness of body, mind and heart. 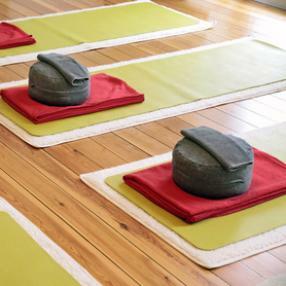 This class offers a gentle format to help eleviate pain and tightness in the body. Also incorporating breath work and relaxation techniques that help with stress/anxiety reduction. Exellent for those wanting a more gentle, healing practice. Are you wondering: “Why do Yoga?” The short answer is that yoga makes you feel better both mentally and physically. A yoga class can be a powerful, learning experience in which you will literally rediscover your body, how it works, and what it can do. Start with the basics and develop an individual practice, with an emphasis on posture, breath and establishing a flexible, strong body. Learn how to do something new in each class and build confidence through repetition, also learn how to take your practice off the mat and into daily life. Never being asked to do something you can’t or be turned into a pretzel, we are Gentle here, listening to our bodies. 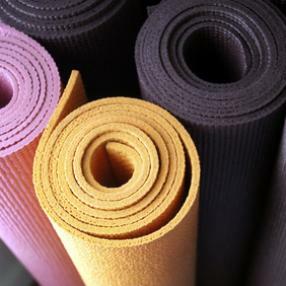 Yoga let’s you tune in, chill out, and shape up – all at the same time with a therapeutic touch! Please bring a mat & blanket. Classes are 75 minutes. Alignment based vinyasa flow. Expect longer holds, inversions and arm balances. Some experience with yoga strongly recommended. In this Iyengar yoga class we will touch upon yoga fundamental poses and basic and incorporate stretch with props to help get us in a safer and deeper alignment to feel the benefits stretching thru yoga poses. Yoga is famous for its mental and physical fitness such benefits are; Strength, Flexibility, Control, Stress, and release of tightness and back pain, neck and shoulders. Have fun with the usage of props while stretching. Getting a little stiff and wondering what to do? Can’t keep up any more with your grandchildren? Afraid to get down on the floor for fear you may not be able to get up again? There are so many facets and aspects of our life-style, which due to our maturing, negligence and stress can turn into a problem and make us afraid. Let’s work together to dismiss that fear and find together a Yoga Therapy Solution for you. Embedded in an ‘easy does it’ practice on the floor, just as if you were lying in your own bed, moving the body from toes to finger tips. You will get down once and up once in each class, with help and through learning and building strength in the legs and arms it will become easier. Yoga is not about competition plus don’t feel self-conscious, everyone will be in class for many of the same reasons. Not there yet, but it’s just around the corner, then come to learn how you can prevent now. A special class just for you. Please bring a mat & blanket. Special Senior Discount Class: 90 minutes. This a longer version of the mat class including yoga with the chair. Whether you are just beginning to practice yoga, returning after a break or simply want to learn more for your own home practice this class is for you. It consists of building on the previous with instruction in the postures and breathing exercises that create the building blocks of Iyengar Yoga. The use of basic props to enhance their effects will be covered, as well as your individual needs and concerns. An active style of yoga, done at a pace that allows the students to focus on proper body alignment. Each class includes a focus that helps students connect to their bodies, hearts and the world around them. All Levels. Vinyasa, Strength & Resistance training. Prevent injury while rehabilitating physical, energetic, and emotional challenges. Students will learn to mindfully move their bodies safely and to strengthen the supportive muscles that may be weakened due to learned compensation from repetitive motions in your daily activities. Enjoy a one hour all-level Hatha Yoga Flow to connect to self, to release tension in the body and tune-in to what's important for you. Deep stretch with props is an Iyengar yoga class, using props like the rope wall, straps, chairs, blocks, and more to focus on proper alignment and increase flexibility.